The past week has been insane in ways I’d rather not detail, and I just couldn’t get a regular strip out for today. I normally try to announce ahead of time if I need to skip an update or post filler, but this time I couldn’t help it. Sorry for the filler, but I’ll make sure Monday is right on track. Last couple days have been inSANE. I hope everything sorts out quickly and well. Take care. Hope it calms down for you quickly! Hope you can leave it behind and look forward to next week. I really like your abstract. When I first saw it, the images and their angles made me think of people dancing. Love the featured colors, too. 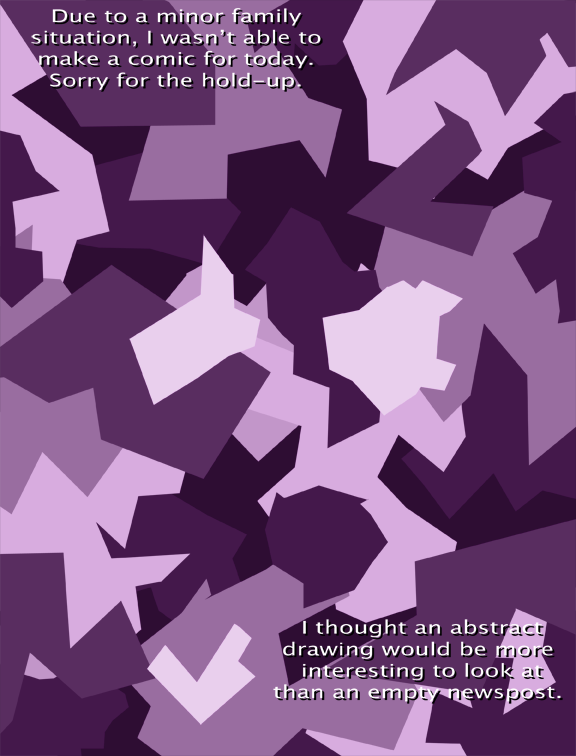 By abstract, you mean Selkie-vomit? I came to the comments to say the same thing! Pretty angular vomit…..no wonder she’s been so sick, she has purple shards in her stomach! If that is Selkie-vomit, I know some microbiologists who’d give their eye-teeth for a sample. Is this a beautiful mosaic? Or a picture of Selkie’s purple throw-up? Vomit fishes, the abstract interpretation. Don’t sweat it. Family/Personal Life comes first. I’m not goin’ anywhere. Is the Merry Lurker watching…? Er, knock yourself out, Dave. Don’t you worry. That’s okay, take all the time you need. Oh no! So sorry to hear that! Hope everything goes well! Sad about no comic. Sadder still to hear that you’re dealing w/ craziness of the not-fun kind! Don’t worry about us; take care of yourself, and your eager fans will be waiting (mostly patiently) for your return! Meh, it happens. Family first and all that. Take care of your business man, no sense pumping out comics when you’re distracted. Take breaks if you need ’em, and I hope things are ok for ya. No worries, life happens. Good luck! 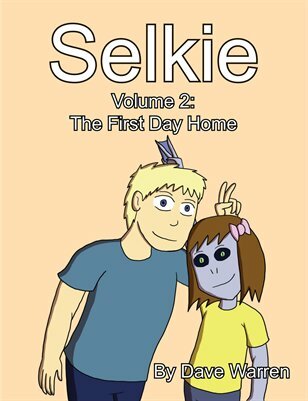 Just caught up on Selkie after being away for about a year. You have been doing a fantastic job on the comic sir! It is progressing in a wonderfully heartfelt manner. I am an especially big fan of Todd. Being a single father is a daunting and full-time job. This is why, I have suggested in the past you build up a buffer, because life is random and you never know whats going to happen. I used to have one, but it burned through a long while ago. Putting the nose to the grindstone and rebuilding it may not be a bad idea, though.